Tuesday: 11 a.m. - 9:00 p.m.
Wednesday: 11 a.m. - 9:00 p.m.
Thursday: 11 a.m. - 9:00 p.m.
We offer a large parking lot for our guests comfort while coming to dine with us. Slow-smoking is our craft & we believe in using the high-quality meats and local ingredients throughout our menu. We BBQ low and slow at a constant 250 degrees using locally-sourced seasoned oak and fruit woods. Every item on our menu is made from scratch, from our four unique barbecue sauces to dip your ‘que in, to our mouth watering sides and fresh-squeezed lemonade. Nothing goes better with barbecue than a nice cold beer and our bar features 13 local-craft beers on tap and approachable cocktails featuring fresh ingredients and house-infused liquors. Due to the long hours it takes to create our BBQ please keep in mind we occasionally run out of certain BBQ meats. Good food, great service, and not crowded on a Saturday night! Thank you for hosting a party of 10 to 15 on such short notice. Our company loves Fahrenheit 250 and will cont. do dine there. Everyone is always wonderful and the food is great. We went there for Valentine Day. It was a pleasant place. The food was fresh and delicious. 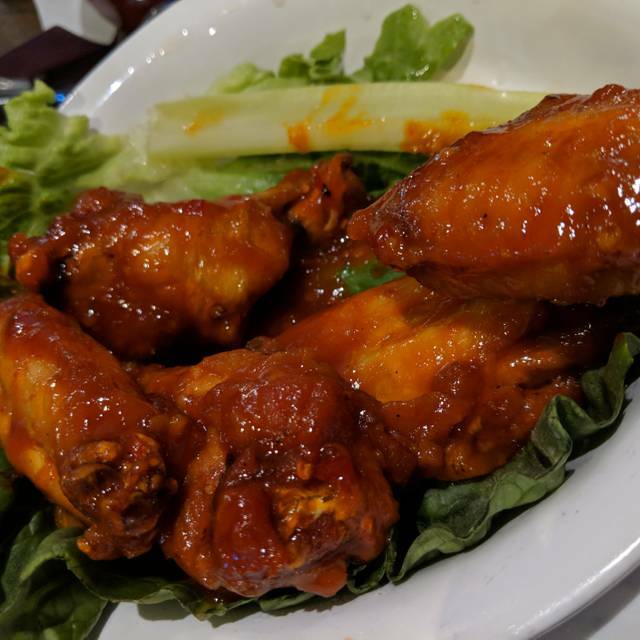 This place is pretty good, chicken Wings are really good. Our experience exceeded what we had even hoped. The menu looked good online so we decided to try it. Portions were generous and each item was delicious. Smoked meatloaf - amazing! Food was okay. I wasn’t impressed by anything. The portions are huge, prices are reasonable, plenty of parking, friendly staff. Nice neighborhood BBQ place. Food just lacked depth and flavor. The meats were okay but the sides were pretty sad. I never had a macaroni and cheese that I didn't like and it was starchy and bland - likewise for the "cheesy" grits. Byron, our waiter, was great. He has such a happy and helpful demeanor. Visited with a group of 7 for dinner on Saturday night. Delicious barbecue! Everyone ordered combo platters, and between all of us, we tried the brisket (lean and fatty), tri-tip, ribs, meatloaf and jerk chicken. All but the chicken, we'd order again in a heart beat. Although I enjoyed the decadence of the fatty brisket, the grease was a bit much after awhile. Enjoyed the sides (mac & cheese, garlic green beans, and chili) but wished everything was evenly hot. Seemed like the sides sat and waited while other parts were plated. Service was great though. We ran over to get a quick dinner between sporting events at Sac State. The exterior was a bit off-putting - just not sure how the food would be (I know, don’t judge a book by its cover!!!). Wow - the homemade chips and smoked salmon dip were a fantastic start (be prepared to wait for the homemade part, but worth it!). The tri tip “Blues” salad was absolutely loaded with awesomeness - paleo people will love it, and do NOT ask for double protein! No need - this salad is totally perfect from start to finish with flavors that will surprise and delight you. Excellent food!! From the wings, to the BBQ, sauces, and pie were delicious! We've had pretty good experiences at Fahrenheit 250, but this wasn't one of them. There was one server handling both the bar (including making drinks) and the seating all around the bar, so service was very slow. We ordered a combination dinner that was supposed to include brisket, but the brisket was super overdone and shredded, to the point some of it was closer to jerky than brisket. I was sad because this is one of the closer and better BBQ spots to our home and we were pretty disappointed. Great value. Brisket wasn't the greatest. It was over shredded and tossed in bbq sauce. Chicken was great. The sweet tea tasted like it been sitting out too long. Our waitress was great. - Hamburger was tasty but fell apart when trying to eat it. consistently excellent. 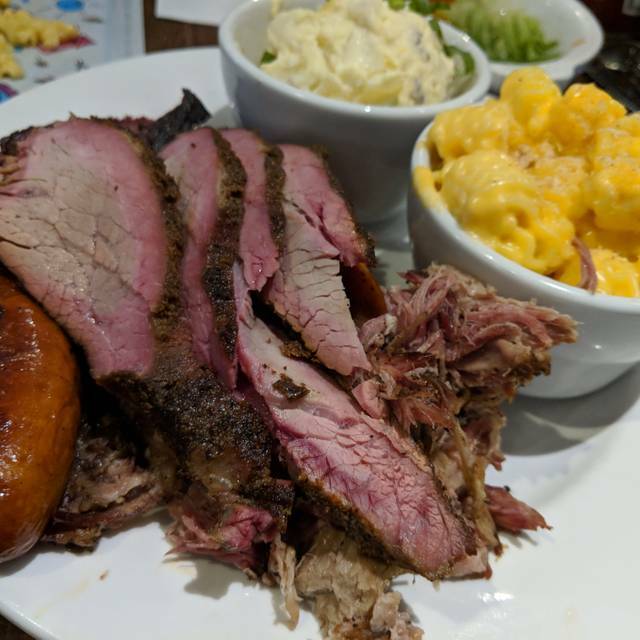 We recently had a family gathering there and everyone loved their food; the ribs fell off the bone; the tri tip melted in your mouth; the brisket was moist and tasty; and the salads were very fresh. The side dishes are awesome, especially the garlic fries. There's something for everyone! We truly love Fahrenheit and plan to make this our usual family gathering place for dinner. My husband and I are regulars for weekday lunch. Love it! The food was great and the service was wonderful. The atmosphere was warm and relaxed. Their selection of drinks was great. Great place for good BBQ! The place had a relaxed feel to it. The food was amazing and not swimming in BBQ sauce. Each table had a variety of sauces so you can dress your own which was great. They have out door seating which we did not have because it was to cold but during warmer weather it would be a great spot to be seated. This will be the only BBQ joint my family will be going to! We have eaten here before, mainly for lunch, This dinner was THE WORST EVER! Our table of 8 all ordered the rib plates. The other diners plates did not look too bad, except one other dish had a charcoal piece of meat. Our platter, however, was almost all charcoal, with two pieces totally inedible and those we had replaced with two very nice ribs. We should have refused the whole platter, but we were too nice and ate the rest of the 11 not 12 we were supposed to get. The wings were different but good. The Philly steak sandwich could have been a little larger in size. Lastly, fewer nitro beers might have created a better flavor profile. A second visit during a time not as busy as Friday night should be attempted. Our food came out fast but it was cold. We asked to warm it up and they told us for health reasons they couldn't send it back to the kitchen. What! They brought us extra dirty fries , which were good, because ours was cold and then charged us for it! The chicken and ribs were chewy( overcooked) but the brisket was delicious. They didn't have decaf coffee, I had to ask for cornbread, drinks and silverware which we ordered. The waiter was super nice just felt like he was unprepared. I made this reservation a week in advance for my son's 16th birthday. I was disappointed! Took the family (2 adults, 3 teens) here for Valentines dinner, our first time eating here. Food was really good! Brisket chili was ridiculously spicy, which was sad for me because I love chili but it was too spicy for me to enjoy. My husband did eat his, but also said it was a bit too spicy for his liking. On the plus side, it was chocked full of yummy brisket. Standouts were ribs, pulled pork, dirty fries, potato salad and cornbread. Looking forward to our next visit and trying some of the cocktails on their bar menu. Inside is nicely decorated in a rustic theme. Plenty of parking, even on a holiday. Total check for 5 with soft drinks was $103 plus tip & we brought home enough food for lunch tomorrow for two people. Not too shabby! The meat was very good, and their unique barbeque sauces were delicious. The green beans and mac and cheese, however, were very salty. We had enough to eat, but I expected to get a bit more for the amount paid. Overall, happy with the experience. Our server, Taylor did a great job! Very knowledgeable about the menu, and took great care of us. Food was great, although Brisket was served lukewarm - was not expecting that. Our server was excellent. She had great knowledge of the menu and had an excellent, warm, approach to the dining guests. Good food, service was helpful. Clean dining room. Seats were a little close to other patrons, I felt like we were dining with the table next to us. Beer was overpriced. But decent local brew selections. Food was REALLY BAD. Ribs were so tough I only ate one....I assume the rest went in the garbage. Husband also had the ribs and fought his way thru a few of them......lots of chewing. We both ordered regular fries which were VERY spicy. The coleslaw was absolutely tasteless. Best thing about the dining experience was the Moscow Mule and it was just average. We had redeemed 2000 points for a $10 card to use here but our waitress said she had never seen one and couldn't figure out what to do with it. We asked for the mgr who said she couldn't get the card to go though and refused to honor it. Open Table had provided instructions but to no avail. I contacted Open Table the next day and a very helpful representative was able to give our points back. Thank you Open Table! Place was amazing! Only draw back was heavy draft causing it to make food and table very cold. As seen on t.v. This restaurant was spotlighted on Guy's Big Project. Though, no one there could tell us what was ordered on air. 😔😔 Perhaps when a restaurant is spotlighted & advertised it on their own facebook page that they were going to be on the show, all the employees should know what was ordered & be able to talk about the segment. But, that certainly doesn't take away from the yummy food. Had the lunch special of shredded brisket (perfectly prepared) with the south (Carolina??) sauce. Served with fries (almost steak fry size, seasoned) & a corn muffin with awesome flavored butter. I bought a small ordered to take home, too. The ranch dressing wasn't too my taste, it's their own recipe & had vinegar added. Just was an odd taste to me & my lunch mate. Price was certainly doable. The lunch special was under $10 (included soda/tea). Virtually the same meal not on lunch special was about $15 (no drink). Sorry, I forgot to take a picture of my lunch. Everything here was awesome, the food was great, literally the best burger i've had throughout my life and the waiter was awesome, nice, and knowledgeable on all the foods the restaurant has. We were in there when it wasn't very busy but the waitress was very helpful. We received our food quickly and everyone enjoyed their meal. My wife had pulled pork which she enjoyed. Ribs are the best in town. Took the family for brother's birthday and ordered the pitmaster platter. Plenty of food for 3 big guys and myself with leftovers. I enjoyed my experience there. My food was perfect and my Wife also enjoyed her meal. I would definitely go back. A friend had a birthday and loves ribs so we thought we would try Fahrinheit 250. We went on a Wednesday at 5:00PM and it was very quiet - which we like. Dinner was more than reasonable for ribs. I found the flavor of the ribs outsanding but had to peel off the salty top layer. I am a salt lover but it was a bit much and took away from the flavor of the meat. But all else was bery good. I would go back.